BILLY MAWASHA, the managing director of Richards Bay Minerals, says that his current appointment is the highlight of his distinguished professional career. Mawasha comes from humble beginnings. "Everything I have achieved has been through hard work and dedication. Also, being young and black in the mining industry has had its own challenges but those experiences have contributed to making me the person I am today." Mawasha attended Pinagare High School in his home town, Taung, in North West Province. His university education saw him graduating with a Bachelor of Science in Electrical Engineering from the University of Cape Town. He also participated in an Advanced Management Programme at Kellogg School of Management in Northwestern University, USA. 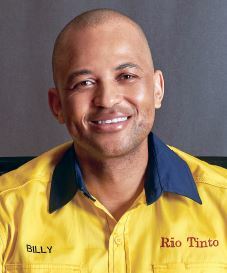 His working experience includes working for the De Beers Group, AngloGold Ashanti and Anglo American (Kumba Iron Ore), in South Africa and Ghana and doing beneficial work in five other countries in Africa (Namibia, Botswana, Tanzania, Mali and Guinea) in leadership, operational and technical roles. Billy also serves on the Board of Foskor (Pty) Ltd.
Mawasha says that his career has been driven by his willingness to learn. "I always strive to better myself. I also think having a curious mind has assisted me in growing myself. It is also important to get the right coaching and mentoring and understanding what teamwork can do to help you achieve goals." These various work experiences have ensured that Mawasha is a strategic, dynamic and people focused business leader with strong commercial, stakeholder engagement, operational and technical skills. He applies these skills to deliver sustainable results and value-add to the businesses he leads. In 2017, Mawasha was selected as a Young Global Leader of the World Economic Forum. This is an honour bestowed each year to recognise the most distinguished leaders under the age of 40, nominated from around the world. This selection came after he was named in the 2016 South African Financial Mail Little Black Book as one of the country's top black leaders, who want to lead South Africa to great things. He says that his leadership style is collaborative. "I aim to create a shared vision and joint strategies with the people I work with. I truly believe in establishing a culture of engagement and being a decisive leader." His decisiveness is evident in his focus for Richards Bay Minerals. "I am people focussed and I am committed to safety; for us in mining safety is the priority. My focus is to ensure that Richards Bay Minerals continues to safely operate while focussing on stabilising and strengthening our community and stakeholder relationships to secure a strong future for the business. The focus is also on Richards Bay Minerals delivering improved safety performance and business growth." Mawasha added that companies need to consider the full range of financial, social and environmental factors that will have an impact on the business over the long run. He says that it is critical for the mining industry to cultivate a strong and sustainable mining approach to development, so it can contribute meaningfully to the economic growth of the country. "At Richards Bay Minerals we are as focused on improving efficiency and eliminating waste as we are about being responsible beyond mining." Mawasha is passionate about education and the development of others. He is a member of the Wits Mining School Industry Advisory Council and the Sol Plaatje University Finance and Investment Committee. Billy also serves on the Board of Symphonia for SA, a national NPO, with a bold and audacious vision: Quality education for all children in South Africa by 2025. When possible, Mawasha finds time to enjoy his hobbies. He says, "I have a passion for aviation; I am a private pilot and an avid traveller. I also love reading as I believe books broaden one's perspective. I'm also in to theatre and film and enjoy spending time with family and friends."